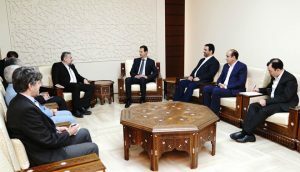 President Bashar al-Assad received on Monday morning the Chairman of the Iranian Parliament’s National Security and Foreign Policy Commission Heshmatollah Falahatpisheh and the accompanying delegation. During the meeting, the two sides discussed the decades-long strategic relations between Syria and Iran, and they affirmed their determination to continue developing these relations in order to achieve the interests of the two countries’ people in various fields, especially political and economic ones. President al-Assad stressed that since its inception, the relationship between Damascus and Tehran has been based on principles, morals, and respect for the will of the peoples to determine their fate and build their future away from any external interference, and this approach contributed to the independence of the two countries. His Excellency stressed the need to make this relationship the basis for creating a bigger network of relations, especially with countries that agree with Syria and Iran in this approach. For his part, Falahatpisheh affirmed that the deep-rooted cultural heritage of the Syrian and the Iranian peoples forms firm grounds on which they stand, as opposed to the countries that are standing today on shaky grounds because they have adopted immoral policies that contradict international law, whether by using terrorism as an instrument to achieve their interests, or imposing sanctions on countries which disagree with them. There was consensus in viewpoints between the two sides on various issues related to the regional and international arenas and the need for continuing coordination between the two countries.